I've stopped listing all my trips to Shindagin. Going about twice a week these days. 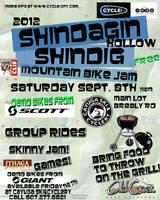 Today was the Shindagin Shindig. I rode my Gary Fisher there for the first time. Riding a rigid bike at Sindagin will definitely make me a better rider. Wanted to demo a full suspension 29" bike, but they were all out by the time I arrived. Huge storm rolled through and dampened things somewhat, but still fun.